A United Launch Alliance Atlas 5 rocket with the Air Force’s second X-37B robot space plane, the Orbital Test Vehicle 2 (OTV-2) rolls out to its Space Launch Complex-41 launch pad on March 3, 2011, one day before launch. The OTV-2 supports space experimentation, risk reduction, and concept of operations development for long duration and reusable space vehicle technologies. This story was updated at 11:14 a.m. EST. The U.S. Air Force is poised to launch its second robotic X-37B space plane on a secret mission today (March 4), with some experts speculating that the classified flight will test new spy satellite technologies. The launch comes on the same day as another rocket failed after lifting off from California's Vandenberg Air Force Base (VAFB). An Orbital Sciences Taurus XL booster carrying NASA's new Glory climate satellite failed to get the payload to orbit when the rocket's nose cone did not separate on time. United Launch Alliance, which built the Atlas 5 rocket slated to liftoff with X-37B, said that that rocket's failure would not affect their operations. 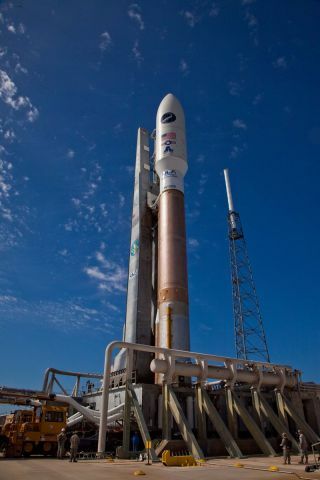 "We are aware of the failure of the Glory launch at VAFB," ULA spokesman Michael Rein said in a statement. "Right now our launch is scheduled as planned and I expect it to take place today." The secrecy shrouding the X-37B space plane has spawned rumors – which Air Force officials have denied – suggesting that it could be tasked with capturing or destroying enemy satellites. But the X-37B is too small and not maneuverable enough to be a viable space weapon or weapon platform, experts say. Instead, the vehicle's main mission is most probably what Air Force officials have claimed all along: a flying test-bed for new space sensors and other next-generation satellite equipment. "I absolutely think that's the primary mission," said Brian Weeden, a former Air Force orbital analyst who now works as a technical advisor for the non-profit Secure World Foundation. Despite its robotic nature, the X-37B space plane received a warm welcome from Air Force crews at Vandenberg. Here, the vehicle appears to be undergoing safing procedures after landing on Dec. 3 at 1:16 a.m. PST (0916 GMT). Significant weathering, or discoloration, can be seen on the spacecraft's upper thermal blanket insulation. Today's launch will be the first mission for this particular X-37B, which is known as the Orbital Test Vehicle 2, or OTV-2. The Air Force has one other X-37B space plane, OTV-1, which just returned from its maiden seven-month space mission this past December. The unmanned Boeing-built spacecraft look like smaller versions of NASA's space shuttles and are designed to be reusable. They also carry solar arrays to generate power, allowing them to stay in orbit on missions of up to 270 days, Air Force officials have said. NASA originally developed the X-37B space planes until funding ran dry in 2004. The vehicle program then passed to the Defense Advanced Research Projects Agency (DARPA) before being picked up by the Air Force in 2006. Air Force officials were tight-lipped about OTV-1's mission, and they've been similarly vague about what OTV-2 will do, since much about the X-37B missions is classified. For example, the military has not released details about the space plane's cost, payloads, flight plans or orbital location. This secrecy has fueled speculation in some quarters that the X-37B is the vanguard of a new space weapon fleet. Officials in China and Russia, in particular, have voiced some concerns, according to Weeden, who last year published a report that investigated the space plane and its likely missions. "They see the X-37B, at least in their public and diplomatic statements, as an example of the American space weapons program," Weeden told SPACE.com. While such statements may reflect posturing rather than genuine worry, he added, "I wouldn't downplay their political significance." The chances that OTV-2 will be doing anything aggressive or destructive on its mission are pretty slim, Weeden said. First of all, the space plane is simply too small to pose much of a threat. The X-37B is about 29 feet (almost 9 meters) long and 14 feet wide (nearly 4.5 meters), with a payload bay about the size of a pickup truck bed. The spacecraft's payload restrictions make it a poor candidate to harbor any serious weaponry, or to grapple with other nations' satellites. Also, the X-37B isn't all that stealthy, Weeden said, pointing out that amateur skywatchers were able to track the OTV-1 on its maiden mission. The vehicle is not terribly fast or maneuverable, either, and its shuttle-style runway landings would provide plenty of opportunity for hostile forces to take it out. "It can be tracked, so it's going to be hard for it to sneak up on anything," Weeden said. "And when it comes down itself, it's a very ungainly, slow-moving glider." So if OTV-2 won't be blowing up or otherwise disabling satellites, what exactly will it be doing for months in space? Air Force officials have said that the X-37B is designed to demonstrate new technologies — such as elements of guidance, navigation and control systems — that could be employed on future satellites. The space plane can stay in orbit for up to nine months before coming back down to Earth. So the vehicle enables researchers to examine how pieces of next-gen hardware hold up long-term in the extreme conditions of space. Weeden thinks this is indeed the X-37B's primary mission. A secondary goal could be providing a risk-reduction benefit — the ability to put new sensors or other equipment into space quickly, without having to build and launch an entire, dedicated satellite. "You can fly some parts of it, maybe, and see if they work without having to wait for the whole thing, or without having to risk the whole thing," Weeden said. Weeden suspects that the X-37B may be testing out gear for the National Reconnaissance Office, the intelligence agency that builds and operates the U.S.'s spy satellites — which would explain the secrecy. "As we know through experience, everything and anything about them [the NRO] is classified," Weeden said. Weeden stressed that this secrecy — while mandated by policy— has proven to be counterproductive, feeding speculation about the X-37B's possible nefarious intentions. He thinks a little more openness about the space plane could help reduce tension and, perhaps, foster better international relations. Increasing openness would require a policy change, but Weeden thinks it would be worth the effort. It is not necessary to declassify the X-37B's payload, for example, but some good-faith steps, he said, would have few foreseeable negative consequences. "What needs to be disclosed is its orbital location, because that can be found anyway," Weeden said. "The Russians have an entire network of radars and telescopes. They know where it is." Some groups have come out against the X-37B, saying they're not convinced the secret vehicle is worth all the money and trouble. "With the current emphasis on cutting budgets and getting the most for our tax dollars, the space plane is an extravagant system without a convincing mission," said Laura Grego, a scientist for the Global Security Program at the Union of Concerned Scientists in Cambridge, Mass. However, Weeden said that space-testing new sensors and other equipment is an important and worthwhile task, so the X-37B might be worth the money — but it depends how much money that is. "There is certainly a lot of value in that [capability]," Weeden said. "But how much value depends on how much the cost is, and that part we don't know."